ROCKVILLE, Md., Feb. 12, 2019 /PRNewswire/ -- Choice Hotels International, Inc. (NYSE: CHH), one of the world's largest hotel franchisors, in collaboration with Brookwood Hotels, announced the opening of the WoodSpring Suites Portland North Gresham. The new hotel is the brand's 250th and the first to open in the state of Oregon, marking its continued coast-to-coast expansion. 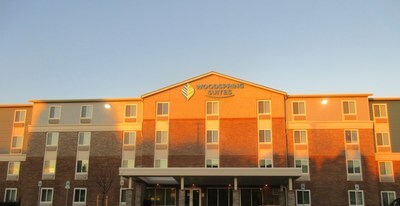 "The WoodSpring Suites Portland North Gresham represents an important next step for the brand as we seek opportunities in key markets throughout the country with strong extended-stay demand drivers and diverse economic landscapes," said Ralph Thiergart, vice president and general manager, extended stay brands, Choice Hotels. "Portland is one of the most business-friendly cities in the nation and an ideal fit for the brand's milestone 250th opening. We look forward to continuing the brand's nationwide growth with Brookwood Hotels." The four-story, 122 room WoodSpring hotel is located at 3013 Northeast 181st Avenue in Portland's Gresham neighborhood, providing convenient access to downtown Portland attractions and Portland International Airport. The hotel is also a short drive to several universities, hospitals and corporate offices, including Fortune 500 companies Nike, Boeing, and Lithia Motors Inc. and subsidiaries of Intel, eBAY, and Hewlett-Packard. "Last year, we teamed with Choice to debut the WoodSpring Suites brand in Nevada and are thrilled to build upon that growth in new markets with another milestone opening," said Darrien Wright, chief operating office, Brookwood Hotels. "The WoodSpring Suites North Portland Gresham offers guests the perfect location and all of the amenities needed to make for a successful longer-term stay." Brookwood Hotels (the "Company") is a hospitality platform company which was formed simultaneously with the acquisition of the WoodSpring Suites brand by Choice Hotels in February 2018. The Company owns more than 100 hotels in the economy extended-stay segment across the U.S., with the largest concentration in Florida. The Company is owned by a Brookfield Asset Management-sponsored private real estate fund.